Romanesco is one of our favorite vegetables. Clafoutis is a baked custard, often a dessert, but also can be savory. As we often enjoy other vegetable tarts omelets or tortillas, I knew the clafoutis would lend itself to the romanesco also. Separate the romanesco spirals, and steam until al dente. Saute the onion pieces until glassy. Puree the tofu with the oil and soy milk until it is a smooth creamy liquid. Add the other omelet ingredients and puree once more. You want a rather thick batter, but one that can be poured. Blend the soy yogurt and cashew butter in a bowl. Add the lemon juice salt and nutmeg. Season to taste with additional flavorings if so desired. Preheat the oven to 425 (F). 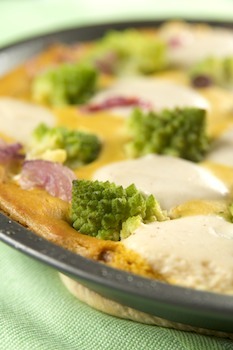 Pour the tofu batter into the greased pie pan, put the steamed romanesco pieces evenly around. Sprinkle the onion pieces on top and dollop the soy ricotta around. Place the omelet in the oven with the lid to bake for 15-20 minutes or until it becomes solid. You could probably cook this on the stove with a well oiled pan. Posted by Chris Walker on November 10, 2008 in Main Dishes, Romanesco, Soy yogurt, Tofu.